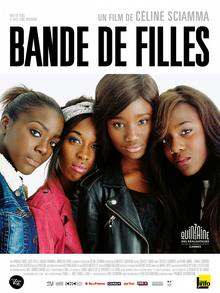 ‘Girlhood’ is a terrific drama from France about a 16 year old girl growing up in a troubled area and trying to find her way in life when there is a lack of positive role models surrounding her. Director Celine Sciamma utilises a cast of predominantly black actors, with the majority of the cast non-professionals who were identified through a street casting process, and this comes through in the raw, natural performances. The film follows Marieme (Karidja Toure) as she falls in with a group of tough local girls when she finds out she won’t be able to continue in school. The film follows her efforts to integrate with the gang, then tracking her journey as she becomes more comfortable in their company. One of the aspects I particularly enjoyed about the film was its exploration of identity and the requirement to act tough in the urban environment the characters live in. We meet many characters over the course of the film and nearly all portray an outer toughness that isn’t matched by the insecurities that lead them to behave in this way. This is shown particularly through Marieme, but also through the character of Lady (Assa Sylla), the leader of the group Marieme falls in with, who shows a noticeable change after a fight with a girl from a rival gang. The other key thing that Sciamma does well is in capturing the characters ‘in the moment’ and contrasting joyful experiences such as when Marieme and her friends dance to ‘Diamonds’ by Rihanna, with the real challenges they face in deciding what to do with their lives as they approach adulthood. At the heart of the film, Karidja Toure is outstanding as Marieme, conveying an inner sense of vulnerability but showing her growing confidence as she becomes more comfortable around her new friends and their associates. Despite this, Toure never loses the inner doubts and insecurities and her performance successfully keeps these bubbling just under the surface. Sciamma picks some excellent musical choices to compliment the action, with an overarching electronic score (sounding very like M83!) helping to heighten the atmosphere and create a sense of poignancy around the character’s actions. ‘Girlhood’ is an excellent film that successfully captures teenage life, with excellent performances from its non-professional cast. Well worth seeking out, particularly for those fond of French or European cinema.